Interesting information about Reiki healing energy, holistic healing, wellness, reiki for people and pets, animal reiki, reiki training, Therapeutic Touch, Axiatonal Alignment, beeswax candles, PrimRose Donkey Sanctuary and more! I contacted the Ontario Turtle Conservation Centre and they got back to me very quickly. 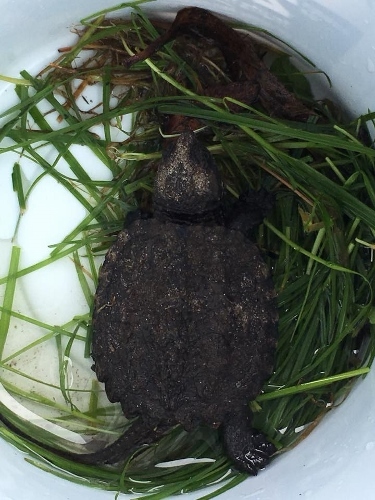 They asked for our location and found a suitable pond nearby for his release. 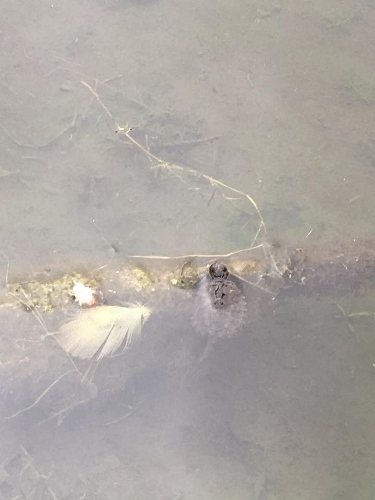 We do have a creek on our property, but they explained that ponds are best for baby turtles. As soon as my hands got near the little turtle, I started to channel Reiki. This little guy took a huge amount of Reiki! The turtle also received Reiki on his way over to the pond. 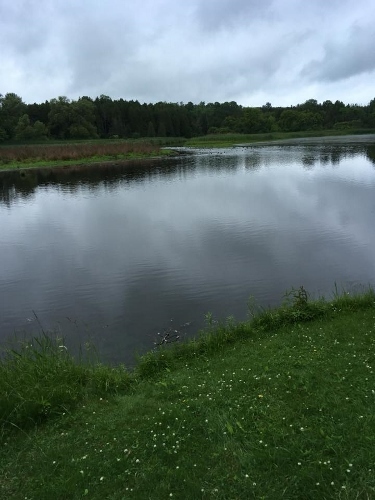 We released the turtle in the pond at Ball's Mill Conservation area, which is quite close to our home. 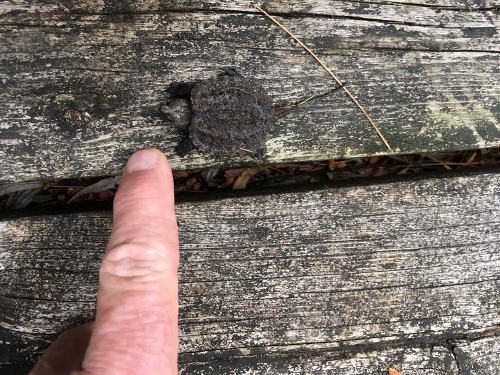 As I released the baby Snapping turtle in the pond, I thanked him for sharing his presence with me and for the gift to be able to offer this little creature Reiki! I love the feather beside him as well. I hadn’t noticed it when I put him in the water. When I got home, I looked up turtle in the Ted Andrew’s book Animal Speak. It states “that you’ve been going much too fast for too long and to slow down and pace yourself”. That was a very important message for me. The white feather symbolizes angels, faith and protection, also assuring me that I am on the right path in my life. 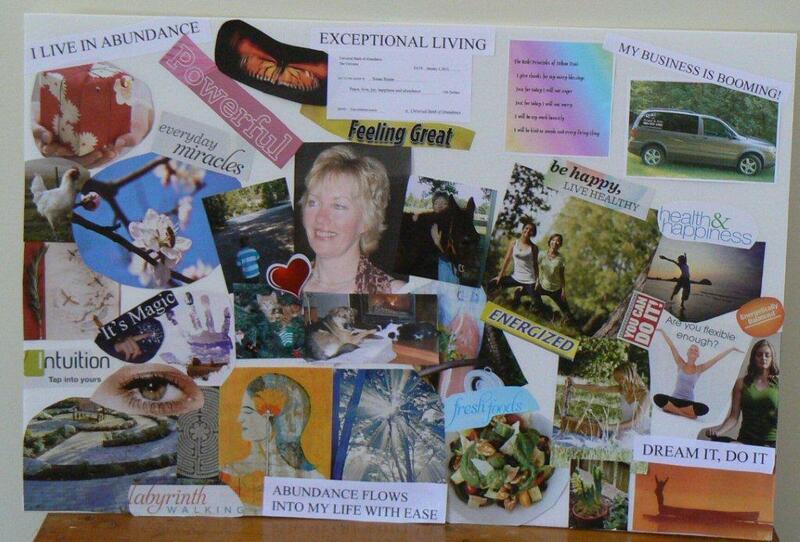 Vision boards work by using the law of attraction. You attract positive or negative into your life. Attract the positive! I use a large piece of foam board from the Dollar store, it works better than bristol board. You can keep track of the date that you made your vision board and the date that your items on your board manifested. Glue the blank list on the back of the board and write the date that you created the vision board. Put your happy smiley face in the middle of your vision board. Find the pictures, images etc. then think about what they mean to you and why they attract your attention. Be very specific about what you want. Use affirmations, words, pictures, photos, quotes, drawings, symbols, stickers, ribbons and anything else that you can attach to your vision board. Use pictures that are big enough for you to see easily. Remember you want your board to be very attractive to you. Before you glue images and items on, place them on the vision board to see if they are where you want them. You want your vision board to excite you when you look at it. It should be colorful and dazzling! State your visions, dreams, objectives and targets. Abundance cheques: Make the cheque out in your name, with the date you created the vision board. In the memo area you could put limitless abundance or services rendered, whatever makes sense to you. It is signed by the Universal Bank of Abundance. Write an amount that is believable to you. You could write a weekly, monthly or yearly amount. Different types of vision boards: Business board, family board, relationship board, house/home board, healthy habits board, financial board, places you’d like to travel board or a potpourri board which is a mixture of visions and dreams. Color: Use color to attract what you want to receive. Different colors attract different things. Some suggestions are blue for business success, green for health, rose is for relationships, yellow is for insight and knowledge. Or use a color that means something to you or that you love. If there is something you want to do for example yoga, cut out a picture of someone doing yoga. If there’s a trip you want to go on cut out a picture of that place and possibly a plane, train or car going there. If you want to start your own business find a picture or image and make yourself a business card. Use your imagination! State your affirmations, sentences and words in the present tense. Use only positive words. What you send out comes back to you. If you do say a negative word or phrase then say cancel and this will erase that intention. Words and phrases: Use positive and high energy words. Some examples are: confident, joy, renewed, believe, positive, empowered, peaceful, celebrate, beautiful, love, magic, happiness, grateful, abundance, prosperity, healing,blessings, dream big, dream it do it, release your inner super hero, in control, self-aware, go for it. You can do it! You have the power, healthy and happy, healthy weight, I am relaxed, I am focused. I am inspired! Expect more, new you, exceptional living, joyful life, healthy wealthy and wise, create the life you were born to live! Tomorrow begins today! Earn as you learn. Food/drink that are healthy for you that you want to crave. Exercise that you want to do. Your ideal monthly/yearly income or the amount in your bank account. A trip that you would like to go on. Your vision board should be placed somewhere you will see it often. If you don’t want others to see it, keep it somewhere private. Visualize yourself doing the things you want to do and receiving everything you want toreceive! Use all your senses! Have fun and make it real! If you have Reiki, send it to empower your visions and dreams! I have offered Reiki to donkeys, mules, cats and dogs while they are transitioning, and the energy is very calming and comforting. Offering Reiki while an animal is passing away, naturally or with veterinarian assistance, helps the animal to cross over easier, reducing the time and any pain and stress. The animal’s family or care providers will also benefit from the Reiki energy. You can fill the room with Reiki energy and it will help everyone. Whenever possible, I will usually give the pet or animal a Reiki session before, as well as during, the transition or euthanasia. I find that when animals are palliative or ready to transition they need shorter Reiki sessions. It’s important to talk and communicate with them. While telling them step by step what is going to happen next I send my thoughts and words in pictures to him or her. This allows that, just as for humans, the animal is always in control of the Reiki session. Grounding is very important when an animal is going to transition. It doesn’t keep them here, but helps to send them to the other side, connecting with universal energy. Grounding will also help with discomfort and the buildup of unwanted energy. Because touching can sometimes upset an animal at this stage, and in some circumstances I offer hands-off Reiki particularly to their feet or tailbone. It’s equally important to keep yourself grounded as well. You don’t want to become light headed or pick up any unwanted energies. An easy way to ground yourself is visualize yourself as a tree, with your feet growing roots deep into the earth and feeling that grounded connection. I often use the technique of brushing the energy upward and past the crown chakra as this helps to release the animal’s spirit when they are transitioning. You can also do this in your mind if you see it is either upsetting to the animal or inappropriate to do this at the time. You do not want to get in the veterinarian’s way. Another valuable practise is to energize a blanket or towel with Reiki for the animal to lie on while being put to sleep or passing away naturally. Put the towel or blanket between your hands or place both hands above the item and send Reiki into it for a few minutes. If you are Reiki Level 2 or above, add your Reiki symbols. You will feel the wonderful energy in it. Sending distance Reiki to the animal or pet can be another valuable way of helping with Reiki energy. If you can’t physically be there, whether it’s because of the distance or if it is too emotional for you, Reiki is always helpful. I get very positive support from the veterinarian who attends the animals at PrimRose Donkey Sanctuary. She appreciates the Reiki sessions very much, knowing it helps the animal pass quickly and more peacefully. As well, she has often asked me to clear the excess energy away from the animal after they have passed. This does not keep the animal’s spirits from connecting or communicating with us, but helps them in their transition to the other side. Justin Credible lived a very long and happy life at PrimRose Donkey Sanctuary. Justin received regular Reiki sessions since I started volunteering at the sanctuary. He was always very happy to have his Reiki session. I was with Justin offering him Reiki, when he was put to sleep. Justin’s guardian Sheila, a few of the other volunteers and Justin’s cat Boots were also by his side. This photo was taken on that day. Justin was a much loved part of the PrimRose Donkey Sanctuary family. It was very emotional but I know Reiki helped him to go quickly and with less stress. Justin also had frequent Reiki sessions prior to that day. Russell was a very large and wonderful mule who arrived at PrimRose Donkey Sanctuary extremely thin and emaciated. He received lots of love and amazing care at the donkey sanctuary and lived to be 50 years old. 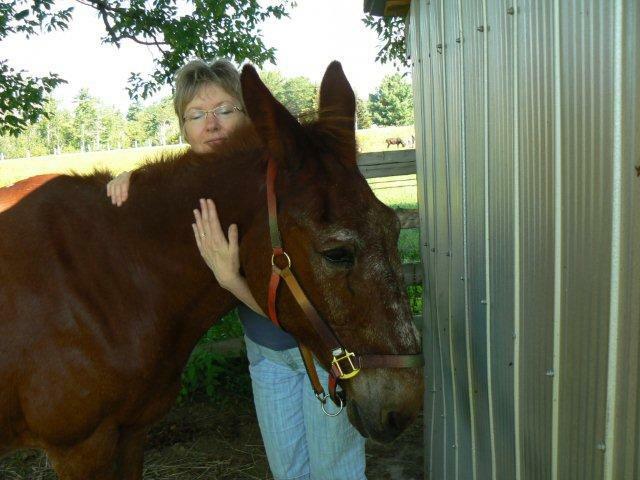 He was an amazing mule that loved his Reiki sessions. The first time I met Russell, I offered him Reiki from across the barnyard and he walked over and plopped his jaw into my Reiki hands. I found out later from Sheila that he had some teeth issues. Russell knew exactly where he needed Reiki! It’s amazing how animals know. Russell knew it was time to go, and I gave him a Reiki session before and during the transition. He knew what was going to happen and was fine with it. He knew it was his time to go. Since Reiki intuitively opens you up, it helps you to easily communicate with the animal. Elliot’s guardian Sheila, along with the vet decided it was time for him to be put to sleep. He was very old and thin and not well. Apparently Elliot had other ideas. 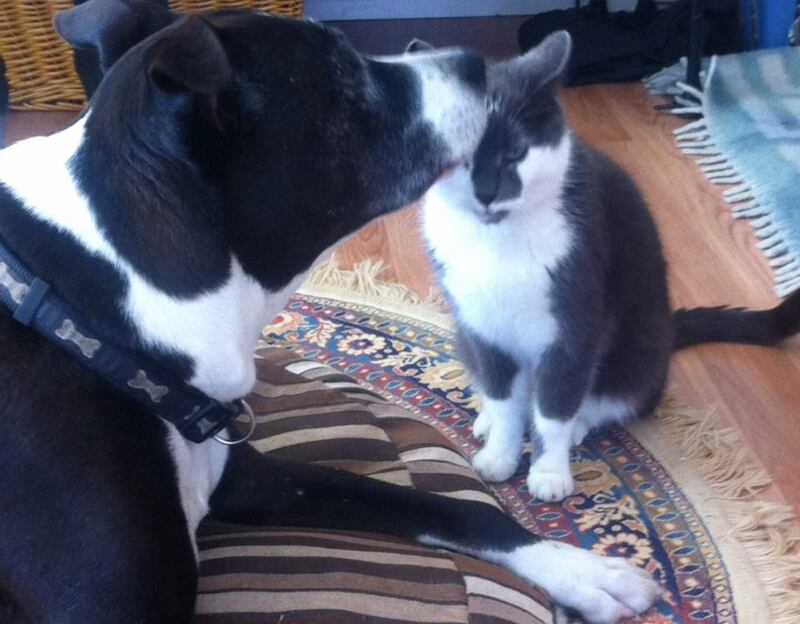 When the vet arrived, Sheila picked up Elliot with the intention of having him put to sleep. Elliot gave Sheila a hard bite, so she decided it wasn’t his time to go. A few days later I was going to the sanctuary to volunteer. As I turned onto the sanctuary road I saw a cat near the road, and it was Elliot. I called the sanctuary and Sheila brought a cat carrier for him. I was giving him Reiki, and very quickly my hands cooled. Elliot had passed away. Sheila was relieved that Elliot had not passed alone, and she knew where he was. She was very pleased that he had received Reiki as he transitioned. Holly had continuing kidney problems since she was one and a half years old. I know that Reiki had helped her kidneys to work well for her, and it helped her to feel well. Even when she was thirteen years old she had the energy of a much younger dog, and people were often amazed at her actual age. Holly was put to sleep close to her 14th birthday with me and my husband by her side when she transitioned. She was receiving Reiki, and she went quickly. Holly was such a sweetie; she will forever be in my heart and with me in spirit. My cat, Mittens, loved Reiki and would sit on my lap as long as I would give her Reiki. I was with her at the vet’s office when she was put to sleep, and she had her Reiki energized blanket with her. Mittens very quickly fell asleep and transitioned peacefully. It’s not easy to keep yourself grounded when offering Reiki to animals when they are being put to sleep, but it is very important. I feel a different sensation in my Reiki hands when an animal has passed away naturally than when they have been put to sleep. For some reason as soon as they have passed over naturally my hands stop sending Reiki. When they have been euthanized, my hands continue to send Reiki a bit longer, even though the vet has checked that their heart has stopped. Always be considerate of your pet or animal and consult a veterinarian. It’s a very difficult decision for anyone to make. We love our pets so much. If possible it’s a good thing to let our other pet(s) see their animal friend after they have transitioned. This gives them closure, and they will not be looking for their friend. They sense that their friend’s energy is no longer present. Reiki is such a gift to help an animal’s end of life journey. It does get very emotional, but knowing that I have helped by channelling Reiki energy is very rewarding. Reiki is love. Susan Rouse, is a Reiki Master Teacher, Animal Reiki Teacher, Therapeutic Touch practitioner and Axiatonal Alignment facilitator. 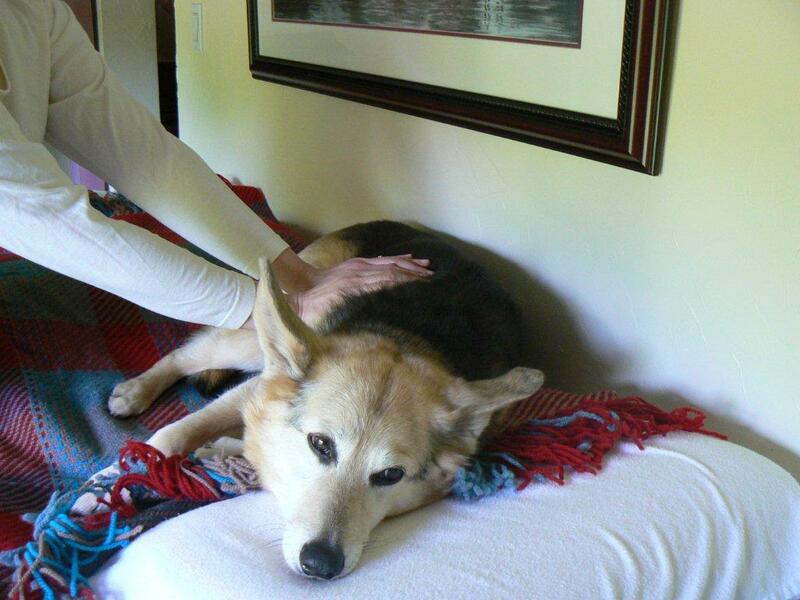 Susan started her journey in energy healing to help her dog Cleo. 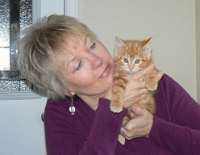 She loves teaching Reiki to others, showing them how easy it is to use Reiki on themselves, other people and pets. I met an amazing woman that has rescued numerous animals, birds, squirrels and others. When I walked into the living room, I met a bird, dog and cat. She wanted me to work with her dog and cat with Reiki healing energy. I had connected with her dog and worked on him with distance Reiki. He felt so much better after the Reiki session. He woke the family up the next morning, something he hadn't done since he had gotten ill. He was in much better spirits. I then met him a few days later and did an in person Reiki session. He accepted Reiki from a short distance at first, then hands on over the area that needed more energy. He knew what he needed! What a precious boy and very lucky to have such a wonderful mom. I ended the session and gave him a couple of pats on the head and thanked him for allowing me to work with him. The cat was in renal failure and accepted Reiki from a short distance, part way through the Reiki session she went to her cat litter pan and urinated. This was excellent! Her mom was worried she was having a problem urinating. Reiki gets bodily functions moving. The Reiki session was done from a short distance but it still works. I know how valuable Reiki is and the animal takes as much as they need. I worked with the cat distance at a later time. She accepted the Reiki distance as well. I energized a towel for both the dog and the cat with Reiki energy. The cat purred when she saw and felt the towel. She loved her Reiki towel! From PrimRose Donkey Sanctuary facebook page. In addition to countless hours at the farm, she brings her students out during an Animal Reiki class and donates a very generous portion of the tuition to the farm. In her spare time (!!??) she & Bill make incredible beeswax candles and she donated a percentage of sales in May to the farm. So, so generous!! And a beautiful, kind lady. So I am pleased to share this for those interested. Check out her website for all her courses. I know folks drive up to Cedar Cove (just north of Cobourg) from Oakville (the lovely Julia!) because they had heard about how special Susan is. If you are sitting on the fence and thinking about learning more, give her a call, you will so enjoy talking to Susan! Allow the melted pool of pillars to reach the edge of the candle each time you burn it, about an hour per inch of diameter. This way you won’t have to try to fold unmelted wax down from the sides and the pillar won’t burn down the middle. You’ll be starting off with the equivalent of a new (but shorter) candle each time. Put out pillar flames by dipping the wick into the melted pool and then straightening (a paper clip is a handy tool). Remember to never leave a candle unattended while burning. Here's some testimonials from previous Animal Reiki Workshops: "I attended Susan's Animal Reiki Workshop on April 23rd, 2011. Susan is an amazing teacher, very knowledgable and cares strongly about animals and her profession. I learned so much. Thank you Susan for giving me one of the best days of my life! "Julia W. Oakville, ON. "Hi Susan, This is a big, big thank you for waking me up! As you might recall, I received my Level 1 Reiki about 15-20 years ago and basically did nothing with it. Having found the Animal Reiki class really excited my passion once again for this fabulous energy. My dog Jazz, a 13 yr old , has never liked storms. As he has aged, his ability to cope has decreased.- Panting, pacing, panting, pacing....Our fear was he would have a cardiac arrest. I took him into a closet and offered him a Reiki treatment. After a few minutes he laid down in the closet and fell asleep. I was thrilled for him! Later, the storm has yet to abate, he comes into the bedroom and lies on his mat and returns to a calm, restful sleep. I couldn't be more happy for him. Thank you, thank you, thank you!! " Lesley D, Guelph, ON. "Susan, thank you again so much for a lovely day yesterday!!!! It will be an experience I will always cherish!!! The photos are great, you captured some beautiful moments. Thanks for all the pictures you are sending. I love photography and I will send a bunch of pics to everyone too today sometime!!! I will most definitely recommend you to anyone who is interested in Animal Reiki!!!! Peace and Gratitude to you!!!!" S.G. Kingston, ON. "It was quite a wonderful experience (Animal Reiki Workshop). When the first donkey comes over to you to receive Reiki is amazing. Your not sure what to expect if you haven't worked with donkeys, but they are so receptive. Susan has them all spoiled with her healing hands. They know exactly what they want and need. Highly recommend this workshop or any that Susan offers." S.P. Stoney Creek, ON. Animal Reiki Workshop at PrimRose Donkey Sanctuary Saturday April 20th 9:30am - 4pm. Helping the Animals We Love Heal with Reiki Energy. Learn the importance of grounding and how to do it. Morning portion is at Cedar Cove Wellness in the Baltimore (Cobourg) Ontario area. Afternoon portion is at Primrose Donkey Sanctuary offering Reiki sessions to the donkeys, mules (Equine Reiki), cats and pot bellied pigs. Cost is $90.00 for Cedar Cove Wellness Reiki students or $120.00 for others. Receive Reiki energized towel, crystal, Animal Reiki Manual and Certificate of Completion. About a year and a half ago, I was looking for a Reiki course because often my aging dogs would have aches and pains and giving them medication was, in my opinion, not the way to improve their lives and I had heard wonderful things about Reiki. Upon seeing Susan’s website on the internet, I contacted her and arranged to take her level one Reiki course. Since that time, I’ve been fortunate enough to take the next two levels of Reiki, took the animal Reiki and Pendulum course from Susan. The class sizes were small, fun, friendly and enlightening. We always share a few laughs and that makes learning so much easier. Susan also has monthly practices at Cedar Cove Wellness and I’ve made many new friends and we exchange stories, ideas, giggles and Reiki. Now, not only my animals benefited from Reiki but the dogs and cats at the local shelters, where I volunteer, are also the recipients of this wonderful gift. I see them transforming and going on to new homes with balanced, positive energy. Oh and my family and friends are also recipients. Thank you, Susan, my teacher, my mentor and best of all, my friend. You have helped me channel my positive outlook in a more tangible way. It's been a long winter, I can't wait for spring! I am looking forward to warmer weather as I'm sure most of you are as well. I can't wait to see the first spring chipmunk! I have had many requests to add a Advanced Reiki Practitioner course and more information about this is coming soon. Reiki Practices will go back to the second Monday of the month 7-9pm. starting in April. The Reiki practice this month will be on Sunday March 10th 1-3pm. Payment for courses, sessions and workshops are now available through Paypal (you can use your credit cards through paypal) on the Cedar Cove Wellness website. You can still pay by cash or cheque in person. Axiatonal Alignment Class Friday March 15th or Saturday March 30th 9:30am-4:30pm. Axiatonal Alignment assists us to reconnect to our Source. These Axiatonal Lines are throughout the universe, galaxies, solar system, our planet and our bodies. Axiatonal Alignment is a treatment which involves three passes down the body. During each pass the practitioner will lightly touch the client at specific points on their body. These points, when put together, will trace out forms of sacred geometry. After a Axiatonal Alignment session, many people report feeling energized, having more focus and clarity of thought. No pre-requisite. You will learn how to do Axiatonal Alignment on yourself and other people. We will have lots of time to practice. You will give and receive a session.This may also be done on pets from a distance or in person if the pet is very laid back. You will receive an anointment (attunement) that facilitates Axiatonal Energy. First Degree Reiki Level 1 Certification Course Saturday March 23rd 9am - 5pm. 2 openings left. Learn to use Reiki with people, pets and animals. Energizing with Reiki Energy Workshop Thursday March 28th 10 am - 2 pm. Learn the amazing effects that Reiki energized items can have for you and your loved ones. These 100% Pure Canadian Beeswax Candles have been energized with Reiki and send Reiki healing properties into the air while burning. Beeswax tealights, votives, small, medium and large pillars and hand dipped taper candles are available for sale. News from PrimRose Donkey Sanctuary: Welcome the latest addition Lamby Lambert. Lamby has got a beauty mark of black wool on his sweet face. Miss Kitty showed up on our front porch at 4:30 am on November 28th 2011. Our dog Winnie woke us up barking. My husband went downstairs to investigate and heard a meowing from outside the front door. It sounded like a kitten! I went outside and seen an adorable tiny orange kitten on the front step. I had brought leather gloves outside in case this kitten was feral. As soon as I got close to her my Reiki hands turned on and started to send her healing. The cutest little orange kitten snuggled into my neck and I couldn't believe my good fortune! She had the loudest purr for such a tiny kitty, a very lovely purr of gratitude. I immediately brought her into the house and put her in the laundry room. She opened her mouth to meow and no sound, just a little squeak. I wonder where else she had been meowing. A rectangular dish pan made a make shift cat litter pan and I put the cat carrier with a nice blanket in it on the floor of the laundry room for this baby to sleep in. I gave her some warm diluted evaporated milk from an eye dropper and some canned cat food. This little sweetie didn't even know that food came on a plate. I had to put my finger into the cat food and put it in her mouth. As soon as she found out how good that cat food tasted, she gobbled the food from the plate. It didn't take her long to realize when she seen a plate it meant food! She was so tiny, where could she have came from? We are rural but there are no barns close by and this baby certainly didn't seem feral. Her little belly was swollen, I think from parasites and lack of food. I went back outide with my flashlight to make sure there were no other kittens or mama cat outside. 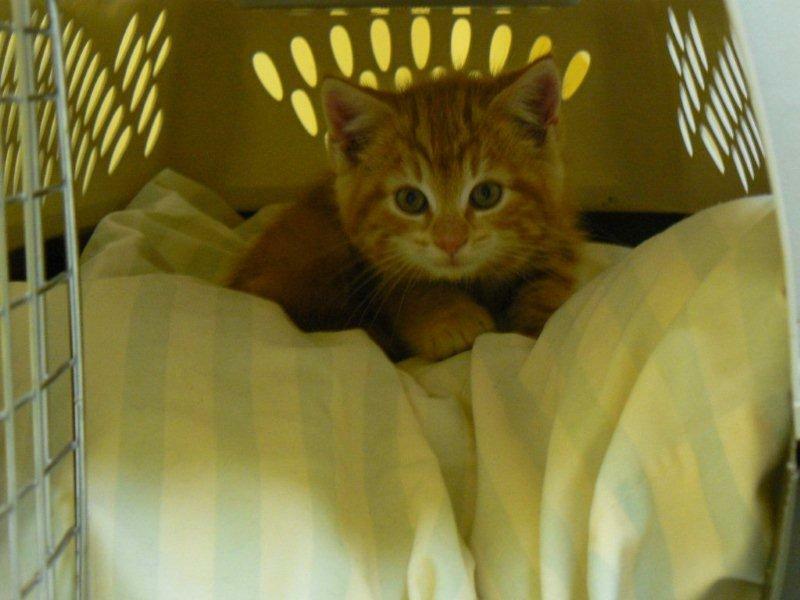 This little ball of orange fur was covered in fleas and ticks. I later used a flea comb and powdered her with diatomaceous earth. It was unbelievable that this little girl had so many fleas and ticks. She was so good to be combed. I know she appreciated the love and attention. My hands sent her Reiki healing everytime I was even close to her. She knew that energy made her feel better. She continued to receive daily Reiki sessions to help with her emotional and physical healing. Miss Kitty Reba Rouse (her middle name is Reba because of her red fur) has become a very loved part of our family. Our dog Winnie and cat Eddie both love her and they will curl up and sleep together. Miss Kitty has received her Animal Reiki attunement, just like all our other fur babies. She likes to help at Reiki courses I teach and Reiki shares, where she will give Reiki to others. She is such a special girl. She's Miss Kitty the Reiki cat!